Scottsdale Muffler repairs cars in Scottsdale, Tempe, Mesa and the surrounding areas. Scottsdale Muffler does everything from fixing and replacing engines and transmissions, muffler repair, to changing oil and tuning up your vehicle so it doesn’t need the more expensive repairs. Affordably priced, the services at Scottsdale Muffler & Automotive can often be a fraction of the cost you might pay at a dealership. Inquire today to get a free repair estimate for your vehicle! If you are looking for a professional and timely mechanic services in Scottsdale AZ, we are the right choice for all your automotive needs from oil change and maintenance to the most complex car repairs, we do it all for domestic and import automobiles. We are a family owned and operated business with 20 years of experience in Scottsdale custom exhaust. Our ties to the community are numerous due to the fact that we were born and raised in Mesa. Scottsdale Muffler has been around since 1997 always owned and operated locally. We entered the growing trend of customization of vehicles for individuals. A customized racing muffler is not always a loud muffler. For one thing, having a customized muffler that is quieter than other cars will mean you can hear the other cars in your vicinity better, giving you more of an edge. Additionally, where people live near racing areas, they will often complain of loud noises and legal problems can ensue. There are laws concerning maximum decibel requirements and Scottsdale Muffler will ensure compliance to these. When you come in to Scottsdale Muffler, you will probably meet Chris McCurdy, the owner. Chris was raised in the business, by his father Jerry, who started out working for Mesa Muffler Company in the 1960s. Chris bought his first stock car at age 15, a 1969 Plymouth Roadrunner. In 1997, Chris went out on his own, mirroring his father’s business by opening Scottsdale Muffler. Chris attributes his business success to his father’s demand for high standards. 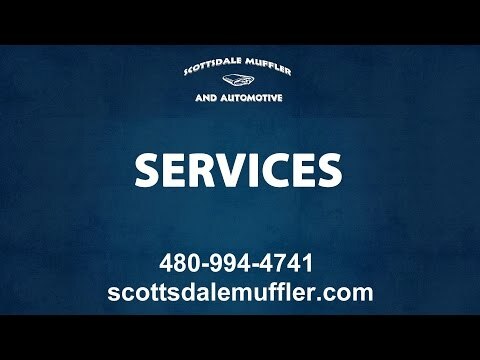 When you do business with Scottsdale Muffler, you are not “just a number” or a client – you are part of the family, and we treat you like one, and hope we build a long term relationship of helping you with your custom car dreams. Our reputation speaks for itself as most of our regular customers have become our good friends. We are a family oriented, friendly, reliable, honest, and fair business. Please stop by sometime and get to know us. We are Scottsdale’s leading auto repair facility for trucks, cars, etc. We have been offering auto repair services in Tempe, Scottsdale, Mesa, Chandler and Phoenix for over two decades and we offer a wide range of car repair services in Scottsdale Arizona. Our work is performed with Scottsdale specialists in all areas of performance as well as general car repair work and we continue to stay on the cutting edge of technology in many areas. Over the years, we have formed strong relationships with our customers and we continue to accomplish custom exhaust removals and repair work for all customers. Our reputation and quality of work is incomparable! The customization, maintenance, and repair of automobiles by mechanics in Tempe started not long after the first cars were invented, and goes back to the early 1930s. These were the first “hot rod” cars with running boards and basic fenders over the wheels. Later, cars were modified by removing the running boards and either removing the fenders completely or replacing them with light “cycle fenders”. Following this, cars had “fender skirts” installed on the rear fenders. Cars were given increased power by installing additional carburetors, high compression heads and dual exhausts. Engine swaps were done which was putting the most powerful engine in the lightest possible frame and body combination. Additionally, suspension was usually altered. Once automobile design changed so that the wheels were encased in fenders and the hood was extended to the full width of the car, several of the earlier modifications were no longer possible. Custom cars really came into their own in the 1950s with headlamp rings, chrome side strips, tunneling head and tail lights and more including making cars lower, or the body thinner and so on. The one thing you will want to ensure is that when noise is reduced, your power is not reduced. This is something our experts at Scottsdale Muffler will take care of. We understand that you are coming to us to enhance the power and performance of your vehicle, not to simply make it “quiet”. There are ways to ensure the noise is controlled, such as having the exhaust terminate way under the car, which helps eliminate noise. There is no single exhaust system that is universally perfect for all situations. Mufflers can be mounted anywhere in the system, and are probably best located near the end of any exhaust pipes. You can also adjust the length of the exhaust pipe in order to achieve the desired power range. There are different ways to go about this, depending on the type of track. One example on a bullring track, is using longer tubes which provide more torque. Whether you are looking for very simple auto maintenance and repair such as oil changes, tire rotations and windshield repairs – or you are looking to become the next NASCAR star – Scottsdale Muffler can help. We stand by our products, we know what we’re doing and want to make you one of our dedicated and loyal customers who will not just “spend a bit of money one time” but come to us over the years and pay us the highest compliment – referring us to their friends and family. Everything you need to know about Scottsdale Muffler and our auto repair services. We are your trusted Scottsdale auto repair shop, over 20 years of quality work and still counting. Routine maintenance or complex repair, our skilled Scottsdale mechanics have you covered. A licensed shop is always the way to go for your auto repair services. We provide all these services and more here at Scottsdale Muffler and Automotive.